EXCLUSIVE: Tommie Lee, the “Love & Hip-Hop: Atlanta” reality TV star who is currently behind bars, speaks with HNHH over the phone. Yet, if one was to have a conversation with Tommie, they’d find a slightly shy, deeply expressive woman who had to grow up quickly in order to survive the social environments she was birthed into. Tommie describes herself as being a hustler, relying on her streetwise knowledge, some of which was taught to her by her mother, in order to survive when money was low and opportunities were scarce. 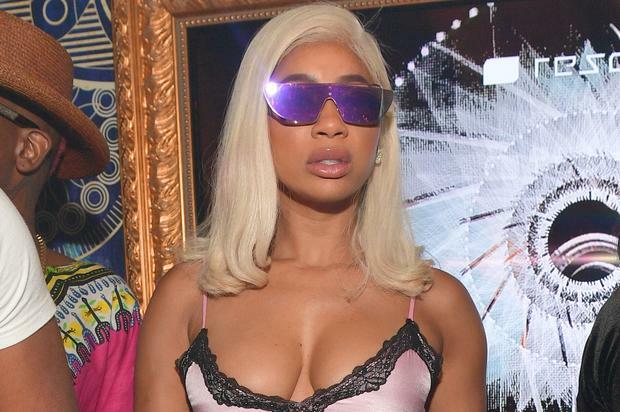 Her stint on L&HHATL has opened doors for the rising star both musically and professionally– she’s even released her own wine named Lè Don– but it’s also made her susceptible to heavy public criticism over every move she makes. Even so, Tommie is a survivor who leans on her close circle of friends and family when she’s feeling defeated. Her recently released Truth documentary gave viewers a glimpse into her private life and the trials and triumphs that have aided in shaping her into the woman she is. While locked up, Tommie has been making the most of her limitations by remaining positive and using her time constructively. She’s been working on her podcast every week (“Last week was addictions and s**t like that,” she says) and recently she allowed me the opportunity to chat with her. It isn’t my intention to neither sensationalize Tommie’s recent circumstances nor discount the seriousness of her current charges. I believe it is, however, important to put speculation rest and allow Tommie to speak for herself. We’ve heard the rumors of alcoholism, a label which she rejects; we’re read the troublesome headlines about her run-ins with the law, mistakes that she’s owned up to; we’ve watched on television as she’s argued with her co-stars, an image that she’s not always proud of. Here, Tommie speaks openly and candidly about herself, her public persona, and what she says is her truth. HotNewHipHop: In your documentary Truth, you speak a lot about feeling misunderstood. What is it that you wish people really knew about your character that you haven’t been able to convey? Tommie Lee: I feel like they think I’m the aggressive Tommie, angry Tommie, the Tommie who’s pissed off…but that’s not me. I’m a whole vibe. People always tell me, “You’re so different from how you are portrayed on TV.” and s**t like that. They only just showed that side. I wish people knew I look out for a lot of people and I’m not a bad person to be around. I’m not…you gotta take me there to get [that angry side] and I wish people knew that there’s a whole other side of me that they’ve never ever seen, and basically I’m not an aggressive monster. People say to me, “I was scared to approach you.” The people that know me know and understand it throughout what they’ve been shown. But sometimes you got those people that are like, “I was scared to approach you, man.” I’m like, “Why were you scared to approach me?” And they say, “‘Cause in the media it just seems this way.” I’m just seen one-way so…I’d just like to show the side that they don’t get to see. I’m not walking around mad every day. Also in the documentary, you talk about your mom being a “booster.” Can you talk about that and how that might have affected your habits, if it at all? I feel like my mom being a booster…it helped me because there was a time where I didn’t have a job and that helped me get through. That helped me survive. I know it’s not the right thing to do, but she taught me [that] when I didn’t have anything, how to get by. Those things and those secrets helped me to survive. It got me into a lot of trouble, too, but behind it all, I’m glad she never taught me to sell my body. Some girls I meet, especially being locked up and I’ve been locked up a lot in my life, some women are forced to hustle, use your body. My mom didn’t teach me that. I’m glad that I still have some morals and respect for my body versus other ways. There’s a lot of throwing around the word “alcoholic” when it comes to describing your habits or behaviors. Do you think that’s a fair assessment or do you think people are trying to label you? I don’t think that’s fair. I don’t think that that’s fair at all. I do struggle with alcohol and I do have issues with alcohol but when I’m on TV, 90 percent of the time, I’m getting a drink when I’m getting my makeup done, when I’m getting my hair done, when I’m on set, when I’m filming…I’m pumped with alcohol. Do I live every day just getting wasted? No. So, they only see me in the life when I’m working. Half the time, I’m kinda shy. I get camera shy, all that s**t, so I drink. I drink to calm the edge, and if I’m mad or filming with a b***h that I don’t like…do I battle with alcohol like drinking too much of it when I do drink? Yes. But am I an alcoholic? I don’t think I am. Your single “Truth” was powerful and garnered an emotional response from listeners. How did it feel for you being that vulnerable with fans musically? Was it difficult to write that song? Did it bring back any memories specifically that you feel comfortable sharing? Yeah, it brought back a lot of memories. It was not difficult to make the song, and I felt like the song was needed because of everybody portraying me in a certain way. It wasn’t difficult to make because it is my truth and I’ve always been…I came at y’all keeping it real. I came at y’all giving you my whole self being very vulnerable and open, so I felt like that side was also needed to let people [see] who I am as a whole. It’s giving some background to where I came from. I felt like it was needed. I didn’t feel embarrassed. If anything, I felt like it would clarify a lot of things out there, a lot of [the] rumors. It felt like a weight was lifted off my shoulder to be able to do that. That’s what it felt like. It felt good. Speaking of your music, what’s the plan for new music while you’re in jail? You released “Pressure” the other week so is there an album on the way? We have so much music! We have so much music that’s ready in the chamber. We’re releasing a whole album. It’s coming hopefully…I will be out soon to do that, but yeah. We have another single coming up with a few features on there [with] Ball Greezy, Youngsta…I’m excited about all of my music that’s about to be released. I just gotta get over this hump. I have to ask…the other day Ian Connor posted a sort of tribute to you on Instagram and you responded you were single. Do you want to say anything about that to shut down any rumors? I’m single! I’m single, I’m single, I’m single, I’m single! Ian Connor has been a great friend of mine but I’ve been single since May 2018 when I broke up with a guy that I was dating off and on. He was my friend for five years and he just got killed this [past] December. I’ve been single ever since me and him split. I don’t acknowledge any relationships after that. Ian Connor has always been my friend and basically, I’ve been dating people since then, like going on dates, not being in a relationship. That’s that. I’m single. I wanna say who gives me a lot of motivation is Blac Youngsta like always, he’s got a lot of positive s**t to say. I love talking to him. Of course Sky [from Black Ink Crew] give a lot of motivation. They keep me going on my down days when I’m not feeling like myself and the media is taking me out. There’s certain people that I can call that can bring me back to reality. Those people, especially when I’m in jail. I see many girls on social media showing you so much love. To those young women who admire you and want to be like you in the sense of being on reality TV, being a model, being a social media influencer, being in the industry, being a business owner…what’s one piece of advice would you give them that you wish someone told you entering into this industry? Oh man, I’ve been so reckless my whole life and not giving a f**k, never knowing that this s**t was going to come back to a head. I would say, you never know who’s watching. Live your life in a way like, if somebody’s lying on you, nobody will believe you, because now…it’s so many things that I can’t even stand up to because everything is just, like I said, coming to a head. I love the quote, “If you don’t plan, you plan to fail.” You gotta plan. You gotta make plans. Don’t just take life day by day. You gotta plan this s**t out and stick to the plan because if not, you’ll end up in places that you never thought [you’d be]. You gotta plan. And this s**t is not easy. It’s never gon’ be easy. Don’t look at certain people and think, “Oh, she made it so fast.” That s**t, people be working for years before they just “make it so fast.” Don’t look at other people’s success and apply it to your story. You have a story. You have a time. Don’t look at nobody else and feel like that’s your time because it’s not. You’re not there because you’re not supposed to be there. Keep working.